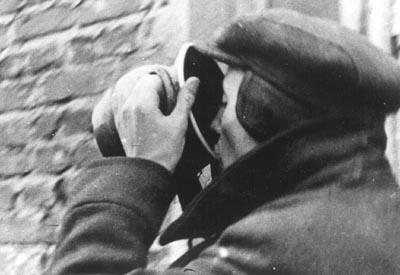 Holocaust Survivors: Photo Gallery - "Hungry Man in Lodz Ghetto"
A man drinks soup from a soup pail outside a soup kitchen in the Lodz ghetto. Written on the back of the photo in Yiddish is "Drinking the longed for midday meal." The average daily food ration in the Lodz ghetto was less than 1,100 calories per day. Photographer Mendel Grossman captured the life of the Lodz Ghetto in more than 10,000 photographs between 1940 and 1944. Grossman died in 1945 during a death march. His negatives were taken to Israel and destroyed during Israel's War of Independence. The photographic prints that were saved were published in a book, "With a Camera in the Ghetto". Photo Credit: YIVO Institute, courtesy USHMM.